Summers are here and so are the summery fruits! 😀 I’m always confused about seasonal fruits but I know for sure that mangoes belong to summers. When I saw these at the supermarket the other day I knew I had to create something with these. I’ve a little sick lately (which would explain why I didn’t post anything for 10 days) and all I’ve been eating is really bland food. 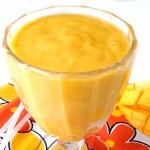 I needed a break so I created something zesty to pep up my taste buds and say bye bye to my sickness. This mango salsa was a spur of the moment thing. I had tortilla chips and I had mangoes, so why not make salsa? I know a lot of people will be repulsed by the thought of a ‘sweet’ salsa dip but trust me, this dip is nowhere close to being sweet. 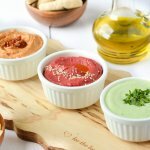 Its a perfect combination of sweet and spicy goodies mixed in a bowl which shouts “SUMMERSSSS” 😀 Everything is great about this dip, I mean EVERYTHING. 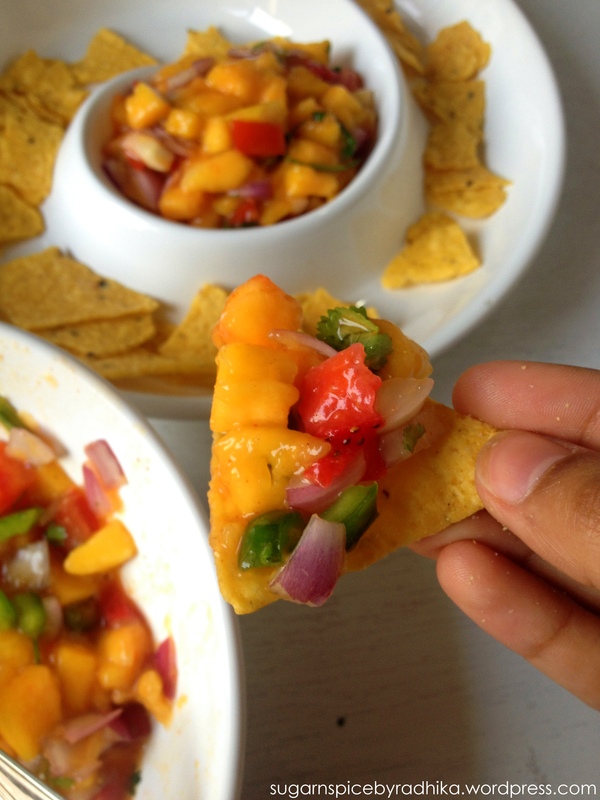 The mangoes give the salsa a new twist that it becomes physically impossible to stop eating it. 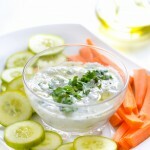 Its a great party food to be shared and even better when you have it all to yourself! 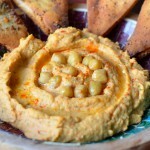 I loved eating it with plain salted tortilla chips but you can go nuts and eat it whatever you fancy. 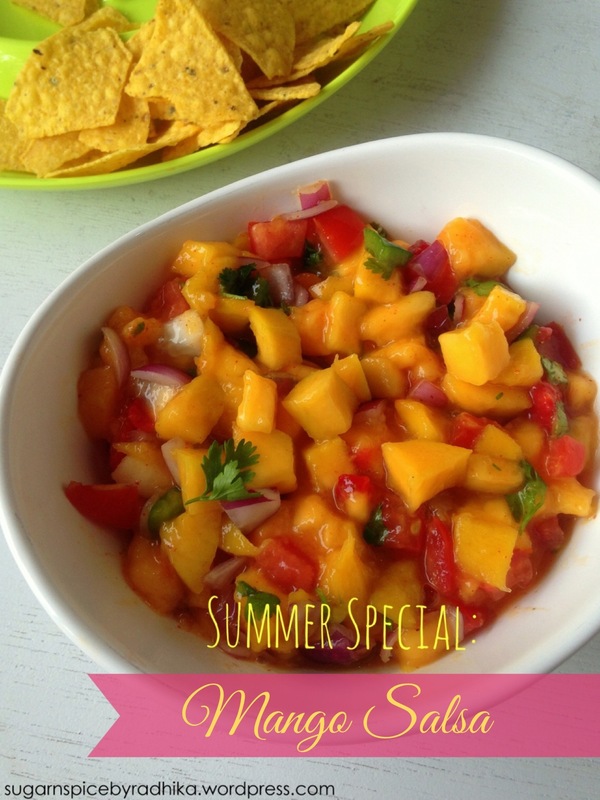 This mango salsa is also a great side dish for chicken! 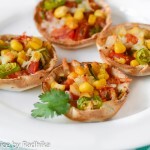 It is also immensely easy to put together like a salsa is, all you need are a few other veggies cut neatly (or not) seasoned with a little salt and red chili powder and a tablespoon of lemon juice. You will have a wonder in your hand! I added a few strawberries too for a little kick too and they tasted great too. 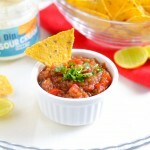 Try it and you will never go back to the regular boring salsa.. I promise! 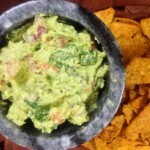 *You can add a few Jalapenos or Green Chilis to make it more spicy. Mix all the ingredients in a bowl and season with salt and red chili powder. The spicier the better! 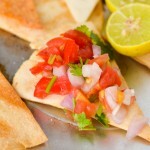 This mango salsa is best eaten fresh with salted tortilla chips, as a side dish or as a filling for tacos or fajitas. Thank you Aruna! I agree.. I needed a change too, hence the mangoes! It really was better than the regular one! 🙂 glad you liked it! Beautiful colors, Radhika! 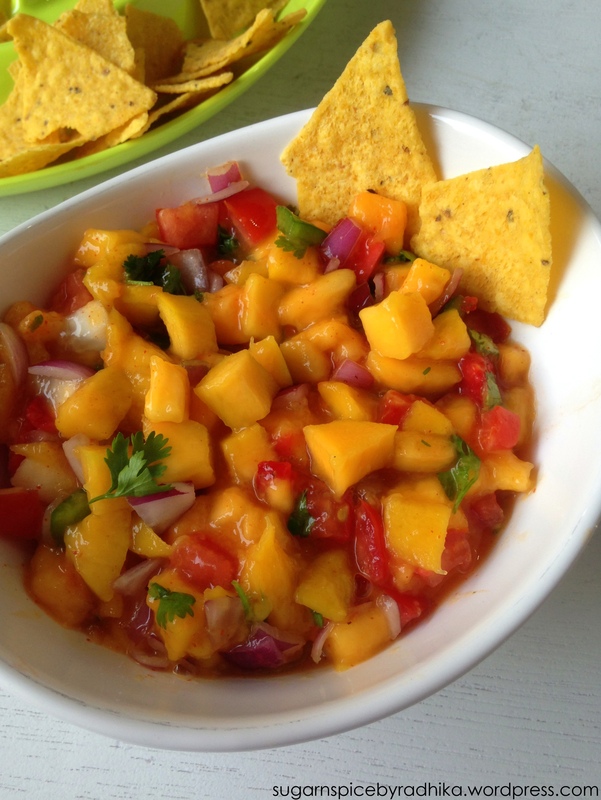 I love mango salsa! Thank you Patty! It’s my new favourite too now!